This certainly wasn’t my first-time seeing Metallica. My history of seeing the band live goes all the way back to my high school days in 1994. Actually, you can add: 1996, 1997, 1998, 1999, 2004, 2009 & 2017. I was fairly certain that I was not going to be surprised by anything, but I was really interested to see the band back in an arena setting for the first time in a decade. The quartet who was one show away from wrapping up their Worldwired Tour that started with the release of Hardwired… to Self-Destruct back in 2016, found themselves at the Bankers Life Fieldhouse in Indianapolis on March 10th. 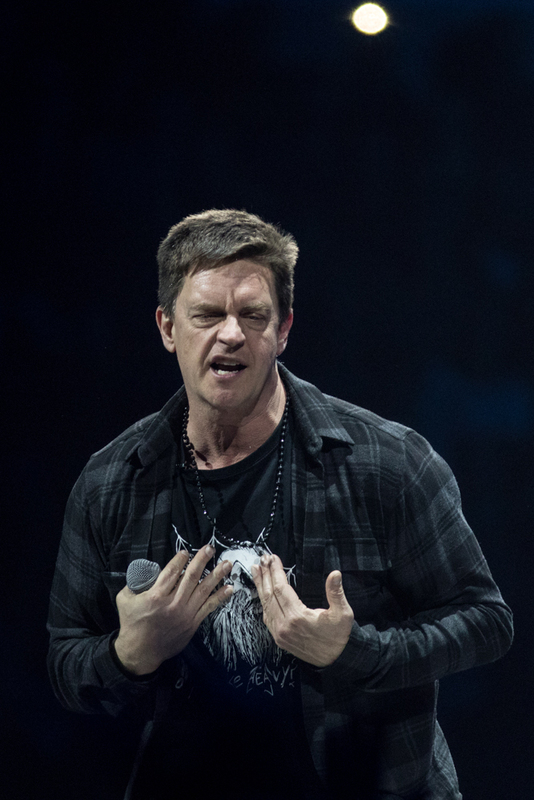 Before the band hit the stage, the sold-out Fieldhouse got to watch the interesting and funny yet still an odd choice of an opening act, comedian, Jim Breuer. Brewer does have history with the band, but I wish that they could have cut his hour-long set-in half and gave an up and coming band a chance to play in front Metallica’s faithful. The night’s 18-song set list was very solid. The songs spanned seven of their ten original albums with the majority coming off their latest and really good, Hardwired… to Self-Destruct. Many of the new songs slid right into the greatest hits set list with ease. The stage was definitely unique. The stage set in the round, sat underneath about two dozen or so LED cubes that danced above the stage at various heights that gave you the feel of a large video wall but broken up so everybody in the cheap seats (at the not so cheap price!) got an unobstructed view. The cubes flashed fire, old music videos, song themed graphics as well as many photos and videos of the late Cliff Burton. It wouldn’t be a Metallica concert without pyro and they certainly remembered to bring the tanks. There was enough fire that while it was 35 degrees outside, no jackets were required inside. In one of the coolest things that I have seen in a while, when the band kicked off “Moth into Flame” a couple trap doors opened from the floor of the stage where dozens of mini drones came flying out and circled the upper reaches of the stage. With the many screens hovering above showing fire, they were acting out the song with high tech. Let’s be honest, with a band of their sound and history they really didn’t need to bring out the tech to the stage show. A few more bass cabinets for “Sad but True” would have worked just fine but the drones were damn cool and a surprising touch. You have got to hand it to the band. As they inch closer to 40-years together, they are still firing on all cylinders. At the conclusion the of the concert, I was talking with a couple seated in the row in front of me and we were in total agreement - the boys kept things fresh, lively and even after all these years and all the tours, you could tell they were having fun onstage and were really enjoying themselves just as we did watching them. They are legendary and are still at the top of their game. Interesting side note, the concert set a new attendance record for the arena at 18,274. Not a real stretch considering it was only 19 months ago that I saw them at the Hard Rock Stadium in Miami that sat twice the amount but records are records and Indy certainly loves Metallica.